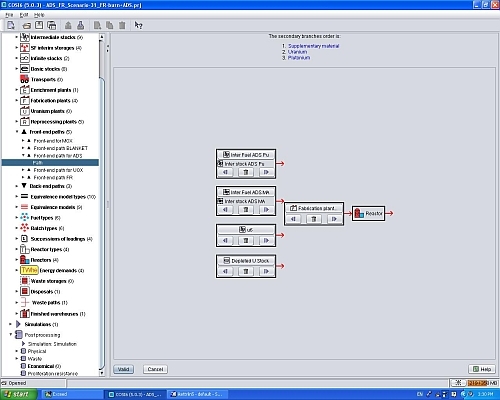 The COSI code (COmelini-SIccard) is a code simulating a fleet of nuclear power plants with their associated fuel cycle facilities. COSI has been developed by CEA (Commissariat à l‘Energie Atomique et aux Energies Alternatives) commencing in 1985 in order to evaluate various deployment options: short, medium and long of different reactor types taking into consideration full infrastructure needed to manage both: fuel supply and disposal of waste. COSI6 is able to simulate the whole range of nuclear facilities: reactors, enrichment, reprocessing, fuel fabrication plants, waste conditioning plants, stocks, and moreover transports. The results include the mass flows between facilities, the isotopic compositions of used fuel, the estimation of proliferation risk parameters, the fuel cycle cost analysis, etc. The simulations performed are time dependent, thus allowing the user to trace the evolution of all relevant quantities. 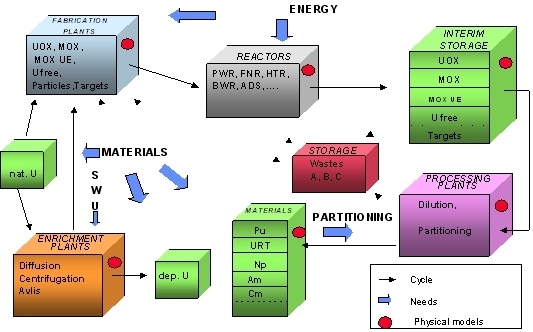 The input simulation model to be developed by the user contains the specification of energy demand, the fuel type and composition (quantity and isotopic vector), the intrinsic reactor core characteristics provided in form of data libraries and equivalence models to be generated and plant operational parameters such as the efficiencies, startup and shutdown dates according to reactor design etc..
Nuclear material flow is traced during entire system simulation (thin black arrows in figure) and its evolution is determined by the decay module “DARWIN” which calculates the change in isotopic composition of materials (full red circles) and the isotopic evolution of heavy nuclides in the fuel during burnup and decay time. assess the needs for natural Uranium, SWU (Separative Working Units), the storage size for the depleted Uranium (DU), spent fuel, reprocessed Uranium mass, materials for recycling and waste. Equivalence reactivity models must be provided for a range of fuel types loaded to thermal reactors and fast reactors, default being UOX, MOX, MOX UE RMA, MOX UE RMA Am, APA, CORAIL for PWR and MOX with or without Minor Actinides for critical fast reactors.